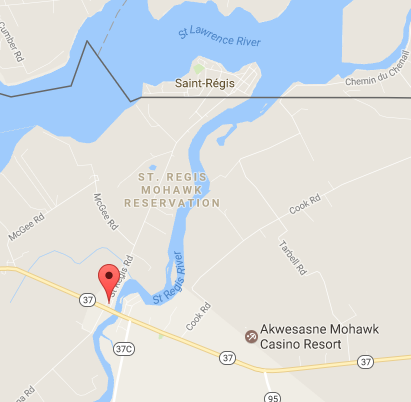 According to the 1910 U.S. Census, Joseph F. Tarbell (so se teio nen tat te) was born in 1890 in Hogansburg, a hamlet of the town of Bombay, which borders the St. Regis Indian Reservation in Franklin County, New York. He is the son of Phillip Tarbell and Nancy Papineau. Phillip had full indian blood while Nancy had only half. Joe was the third-born of seven children. He had three brothers, Frank, Louis and Peter, as well as two sisters, Maggie and Charlotte. 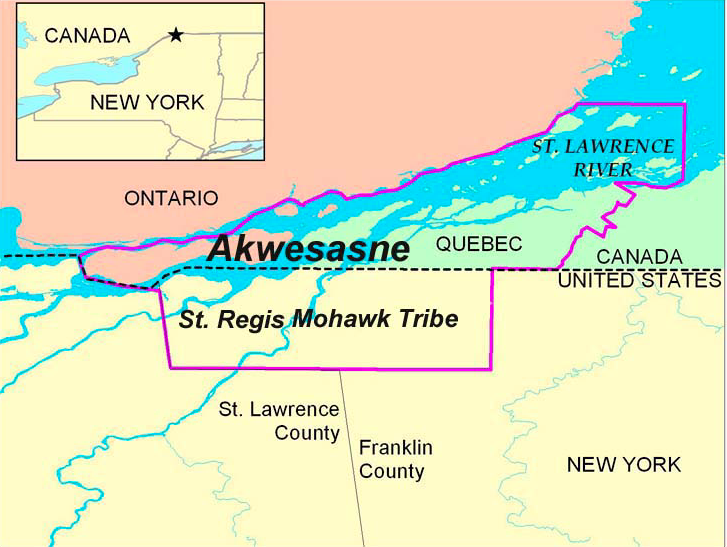 His family was a member of the Mohawk tribe, which is one of the six nations that make up the Iroquois Confederacy. In Joe Tarbell’s school records from the Carlisle Indian School Digital Resource Center, it says he first arrived at the school on August 10, 1901 having had 20 months of previous schooling. He stayed in Carlisle until August 21, 1906. The records indicate that he was already a member of the Catholic church prior to arrival. During these five years, he had a few “outings” in which he stayed with someone outside the school for extended periods of time. One such outing was with someone named Thomas La Rue in Siles, Pennsylvania that started on March 31, 1904. It ended on December 12, 1905 because he ran away. The records do not indicate why he ran away or where he ran away to. After being at home in New York for two years following his first tenure in Carlisle, Joe successfully reapplied to the school at age 17, and began his second term on February 8, 1907. His report card indicates that the teachers at the school felt his scholarship and conduct were both exemplary. However, the records say he “deserted” both outings he had during this time. He left the school for good on November 19, 1910. Joe was apparently a talented baseball player. In 1911, he signed a contract to play professionally with the Albany Senators of the New York State League. But, his career in baseball was short-lived. This can be seen in the records where he self-reported to the school in 1914, saying that he was currently farming in Hogansburg. He wrote a letter to the Carlisle Indian School in April 1917 from Highland Park, Michigan where he was visiting his brother Peter, who worked in a Ford factory. Joseph was trying to enlist the superintendent’s help in procuring a spot in the “Students Course” at the Ford Factory. The superintendent answered Joe, saying that he would not send Joe unless he came to Carlisle and completed preparatory classes. For whatever reason, Joe never took the classes, and instead decided to join the military. 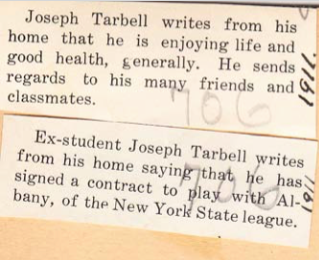 On May 16, 1917, Tarbell, at the age of 27, enlisted in the army. According to his WW I Army card, he served overseas from July 9, 1917 to April 27, 1919. He was honorably discharged on May 15, 1919. Joe was married to a woman named Bessie according to the 1920 U.S. census. However, in the 1940 census, Joe was married to a woman named Anna Bero and living in Mount Vernon, New York, where they had been for at least 5 years. Joe was working as a retail salesman. He and Anna had one child, a daughter named Barbara. Joseph F. Tarbell died on February 16, 1942 and was buried in Hogansburg. 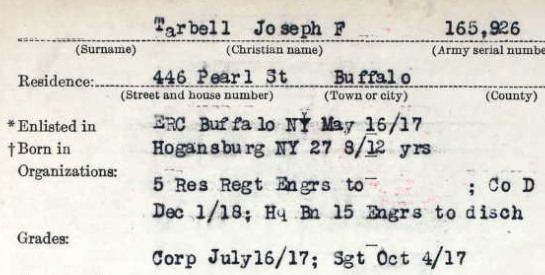 This entry was posted in Joe F. Tarbell, The Conflicted and tagged Ancestry Library, Deserter, New York, Outing, St. Regis Reservation, U.S. Census, WWI. Bookmark the permalink.